In his neverending quest for quality recordings, my good buddy Darren from Velocity of Sound Records just finished putting the final touches on his latest single with Shockwave Riderz that's finally out today. Possibly inspired by Mind Cure Records, he instructed his label scouts to look locally this time and leave no stone unturned in the search for the #1 greatest band in Pittsburgh. Once they hashed it out in a series of conference room meetings and Skype chats they arrived at a pretty amazing surf psych trio that to be fair is two thirds ex Modey Lemon so no one else really stood a chance. A lot of effects and ancient technology have combined with primal raw garage in this A-Side cover that encapsulates everything they're trying to do and was my perfect introduction to the band. A-Side's "Dearest" is a Mickey & Sylvia cover. I think everyone will know that classic duo from their track "Strange Love" when Patrick Swayze and Jennifer Grey lip sync'd to each other while learning to dance dirty. 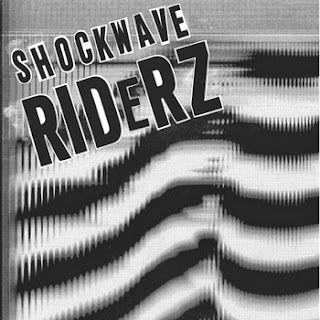 Before Shockwave Riderz even got to melting it down into a completely new take the original has that same slow rhumba rhythm and strong female lead vocal. For Shockwave its not such a weird choice actually, the more I hear this the more it comes off like a combination of Handsome Furs and Dirty Beaches. They have an ever-present digital slant just under the surface, buried by waves of reverb wood block and octave shifting slide electric. Something feels just a little off, as sweet as Sara Mac can belt this one towards the gym rafters, it feels like an animatronic nightmare carnival. It's exciting and mysterious at first but if you start to feel lost you're going to freak out. She'll keep you under control seducing the front row while Phil Boyd and Paul Quattrone bend riffs and rhythms into a futuristic freakout. You can't mistake this for your dad's psych but this isn't completely inorganic either. A crazy sweet spot of idiosyncratic sounds that makes this live somewhere inbwteen all those places. B-Side's "The Punisher" explores a gritty glitchy electric guitar sounding like a pumped up disto-pop update of These are Powers, they go right for a catchy pop but with metallic tin guitars and feed backing synths. This sounds tough, like an alternate reality Cramps that mutated on another planet. The B-Movies were almost the same, just a thousand years in the future and whose tiny details are different and weird but you can still completely get into this. They were really coddling you with that cover though, they've stopped playing nice, turned off the disco ball and pointed an interrogation light right into your face. Surrounded by only bad cops this isn't puffy playing nice psych but a jagged snarling future and you'd better confess. I like that they tag their band camp page with 'leather shorts', an essential part of the sound. Wear them before the summer hitz. Guys I don't have the heart to tell Darren that as much as he has his finger on the pulse of music, he is not such a great businessman. These records are priced at the cost it took to produce them, just $4.39. It doest take an excel spreadsheet to realize he isn't one penny in the red...and that's if every last one of them make it into paying hands. But what can he say, he's in it for the music...not even his own music mind you, but getting great music into the people. He's a revolutionary. 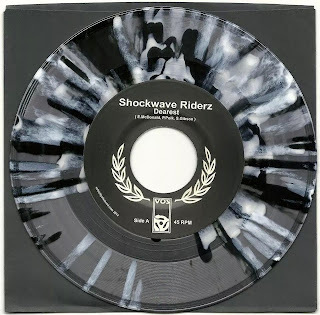 Shockwave Riderz are the guys in sunglasses standing on the side of the podium when we turn into a vinyl based economy. Only records change hands for goods or services. If you saw the first 75 black and white and clear splatter pressing - that's not such a crazy idea.